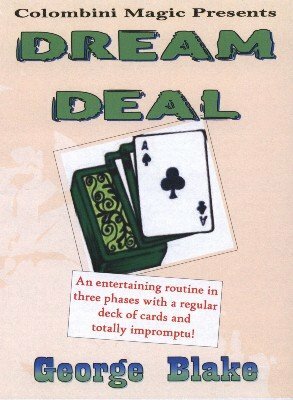 An unbelievable routine in three phases with a regular deck of cards and totally impromptu. You have in your possession a great effect by the late George Blake. The routine, in three phases, starts by having you dealing four 'hands' of five cards each. A spectator selects a packet and thinks of a card and you reveal it. The card is placed back in the deck and again, with a different method, you reveal it. Once again, the card is replaced and revealed with a third way to conclude a very exciting routine. All three phases involve spelling. The effect needs no set-up, can be done with a borrowed deck of cards, even not complete. Just perform the routine as explained and the whole thing works itself. You need just a regular deck of cards. No sleight-of-hand whatsoever, if you can deal the cards and spell, you can do this routine!